Kids of the 80's may remember a sitcom called Silver Spoons. It starred a young Rocky Schroeder (this came before his current spate of badass roles as "Rick" Schroeder, of course...). In the series, his father is a multimillionaire toy inventor, and their mansion is a kid's dream; littered with arcade games, a ride-on train, and all manner of kitsch. Dad wasn't serious about anything, so even in his study he had a bunch of crazy gadgets, including a duck decoy phone like this one. After the US phone system was deregulated in the 80's, it freed up anyone to manufacture a phone. The resulting explosion in the novelty phone market yielded weird gems like this phone that's just ducky. The duck is made of real wood, concealing a pretty conventional 80's cheapie plastic phone inside. In the TV series, the phone doesn't ring - it quacks. This particular phone is a lot less ambitious, ringing with a typical electronic chirp. This is a long time before ringtones, folks. It's cute and novel, though the manufacturers did make an odd aesthetic choice. When the phone rings, the ducks eyes light up with a piercing red. Isn't it strange enough to have a duck phone? Does it also have to look like Cujo? If you're a lifelong Radio Shack fan like me, this time of year used to mean one thing to you... the "dads and grads" sale at Radio Shack. The main product I was usually looking for was the stalwart Minimus 7 bookshelf speakers - a perennial favorite at Radio Shack for nearly 30 years. In the spring you could get them for 50% off, making your buy-in for a good basic set of mini speakers somewhere in the $30 range - a difficult deal to duplicate today. The basic model folks remember is probably the steel cased version, though over the years there were wooden cabinets, and even a sheilded "AV" variety when they started to carry the "Optimus" house brand. They are surprisingly good speakers, especially considering the size and price. Sadly Radio Shack doesn't carry them anymore. For a little while, they sold the Minimus 7 under the RCA brand, but they've been gone for some years. They still offer other low-cost bookshelf speakers, but they're not the same. Your best bet to find an authentic pair these days is Ebay. Minimus speakers were ideal as part of a second stereo system in a bedroom or office, or as part of a surround sound setup. I paired them with a subwoofer I got from a Radio Shack outlet store for $20, and had a very nice satellite system for years. The Minimus 7 became the target of modders trying to coax even better sound out of these bargain speakers. You can find pre-made upgrade kits on Ebay. It's not that the world is devoid of cheap speakers, the problem is simply that they often don't sound very good. There are all those little devices that people hook iPods up to, but sadly the speakers don't really move much air. Hard to get excited about music that sounds like that. It's always best to shop with your ears when buying speakers, but finding a place that will let you test speakers before you buy is getting more and more rare. I haven't found a common speaker that duplicates the price/performance ratio of the reliable Minimus 7. Despite their mini size, Minimus 7 speakers always packed a surprising punch without being a financial knockout. Reach For The Remote - Bohus Is On TV! Hi everybody! Remember me? I haven't been able to post for a while, and I've really missed hanging out on the pages of Retro Thing for so long. james is taking a much-deserved break for a little bit, so I'm going to pinch hit for the next couple posts... provided I can remember how this new-fangled blog thing works. Would love to hear your thoughts on the video in the comments section. We've got some cool posts coming up right here very soon, so make sure to stick around. Glad to be back, everybody! Sony universal remote inspired by Star Trek? Too many buttons on your remote? We get so caught up in the daily news about Apple, Google and Facebook that we tend to forget respectable old Big Blue. IBM was founded on June 16, 1911 as the Computing Tabulating Recording Co., changing their name to International Business Machines in 1924. The company now employs over 430,000 people and has annual revenue approaching $100 billion. That's three times Google's turnover and $35 billion more than consumer juggernaut Apple. The company originally sold a diverse array of factory punch clocks and machines that read punch cards. In 1937, the US government adopted IBM equipment to track employment records for Social Security purposes, and the company went on to energetically market electronic data processing machines to major corporations and governments. IBM has been consistently on the forefront of technology, bringing us the hard drive (1956), floppy disk (1971) and even UPC bar codes (1973) that now grace everything from books to cartons of milk. The introduction of the IBM Personal Computer gave the computing world a standard hardware platform. Unfortunately, the company wasn't able to sustain their leading position in the consumer marketplace -- Microsoft quickly came to dominate PC software, while an army of agile manufacturers created aggressively priced PC clones that chipped away at IBM's market share. 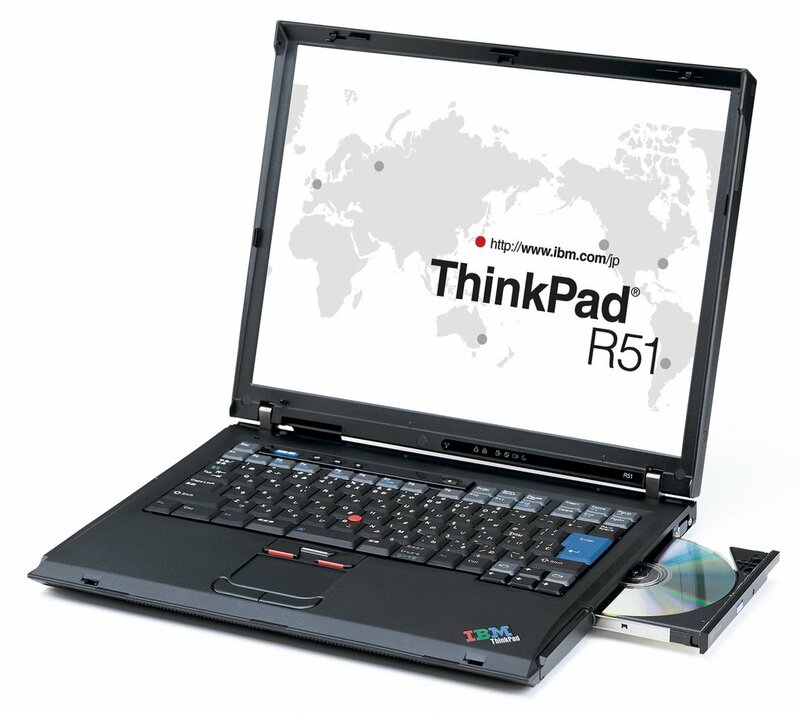 The company backed out of the printer market with the sale of Lexmark in 1991 and offloaded their personal computer division to Chinese powerhouse Lenovo in 2005. It seemed that IBM was seeking to distance itself from the unpredictable cycle of boom and bust that has been the hallmark of the personal computer industry for decades -- today's hot product is often tomorrows amusing antique, and billions can be spent on R&D with unpredictable results. These days, IBM is positioned as the world's largest technology services provider. The company prefers to work behind the scenes to keep the wheels of industry and government turning. I wonder that the next century will bring? The Prometheus Watch Company is a boutique manufacturer based in Portugal. They offer a small but interesting range of swiss-made timepieces. 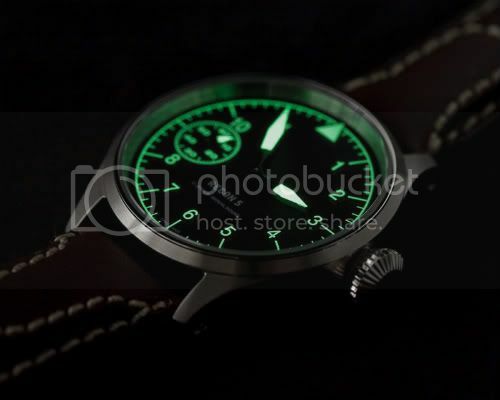 My favorite is the strikingly simple 17 jewel Recon 5 aviator's watch. 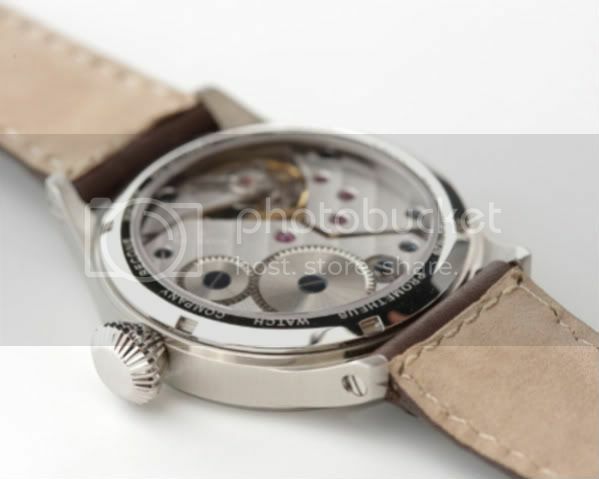 The 44 mm diameter Recon 5 includes a manual wound ETA (Unitas) 6497-1 movement with a Côtes de Genève finish. The case features sapphire crystal over the face and case back, so you can gaze admiringly at the mechanism whenever the urge hits. The luminous face and hands are easy to read in low light. The only thing I'm not wild about is the strap, which features stitching that would look more at home on a Chevrolet SUV seat than a precision-made watch. 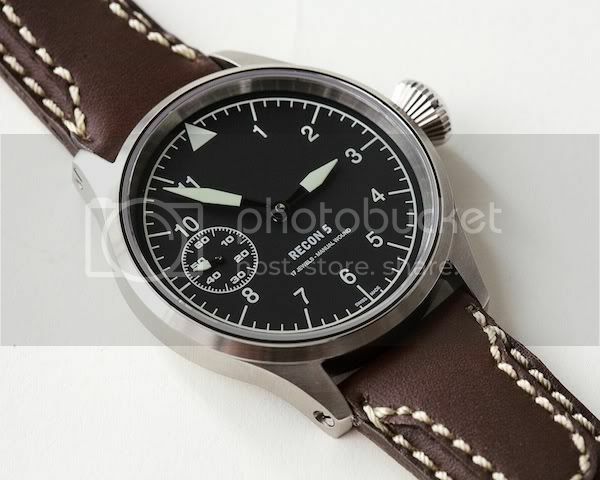 That said, it can be easily replaced with a 22 mm strap of your choice. The price is a quite reasonable €303 (approximately $450), which includes worldwide shipping and a rather attractive leather presentation case. I'm fully aware you can get a decent Timex for a fraction of that, but it's fun to dream. Simon Jansen has just made my life a little more difficult to bear. I used to be happy. Happy with my very own MAME arcade cabinet that I can connect to a last-gen console or game PC... happy with its stealthy black appearance, happy with its arcade good looks. Then I had to discover this... a fantastic Tardis housing a MAME machine. It's not just all Doctor Who-y on the outside - open the doors and the internals mimic the last iteration of the original series' control room (installed by the Peter Davison doctor in "The Five Doctors", as if you didn't know). 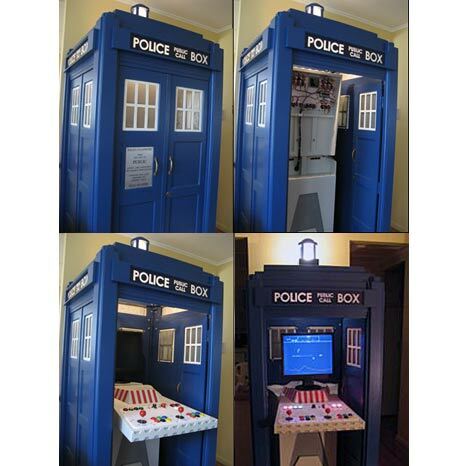 Jansen's writeup of the project is a clear step-by-step report so you can build your own - but what's especially galling is that he used up all of the jokes that I normally would have for this fusion of Doctor Who and retro video gaming. He's also the same bloke who is recreating Star Wars entirely in ASCII animation. I'll never be this cool. While you're checking out his site, I'm going to see if I can find some blue paint. Regular readers might have noticed that it has been a bit quiet around here lately. I've been feverishly working on something, and the time has come to let you in on the secret. Super 8 is the ultimate 290 page full-color hardcover guide for up-and-coming filmmakers. It covers movie camera selection and use, projection, editing (both splicing and digital), choosing the right film stock, a half dozen ways to develop film at home and much more. There's an extensive up-to-date supplier list at the back, along with a list of festivals eager to screen your cinematic masterpieces. Juergen Lossau's painstakingly researched text is presented in German and English (translated by yours truly), and the world class layout was designed by the same team responsible for smallformat and zoom magazines. As you might have guessed, I'm really pleased with the way the book turned out -- it is the most comprehensive Super 8 guide ever printed and will stand the test of time. If you've been putting off experimenting with Super 8 movie making, now is the time to jump in and give it a try. Trust me, absolutely nothing compares to the analog splendor of film grain dancing on the wall, especially when it's your own movie. Follow the jump for a peek between the covers. What a difference a decade makes. This is the RIM 950, a futuristic pager/email/pda released in April, 2000 by a little Canadian company called Research In Motion. It was the perfect companion for Type-A execs and on-call gynecologists. The monochrome display measured 132 x 65 pixels and the backlight allowed them to annoy the theater-going proletariat with a quick flick of the rotary scroll wheel. 4 MB of flash memory and 512 K or SRAM were enough to store hundreds of emails or 20,000 vital appointments in the wireless calendar. You could even surf the Internet. I could ramble on, but there are a couple of important things to note. The first is that this gadget ran an astounding 21 days on a single easily replaceable AA battery. Fast forward to the present and I carry a second battery for my modern Blackberry, just in case the power-sucking backlight leaves me stranded after a few days. Second, it weighs only 11g more than a modern Blackberry Bold 9700. After a decade, you'd expect its progeny to be wafer thin. However, feature creep and massive displays have conspired to keep the weight up. We're turning our phones into gaudy Cadillacs rather than stripped-down racers. It'll be interesting to see what the next decade brings. Will companies keep adding features and power to their handsets, or will we see renewed interest in simplicity? More to the point: Will RIM still exist in 2021? Are you 1/12th the size of a normal human being? Or maybe you're trying to create some sort of diorama of an early 1980s mall for your dolls, but keep getting stuck on how to populate the arcade. Or maybe you just want to pose your 6-inch action figures waiting in line for a chance to play Joust. You're going to love Retro Heart. Handmade in the UK, Retro Heart offers scale models of vintage aracde cabinets and pinball machines. (I know what you're first question is, and the answer is: No, they don't play. They're static models.) About 6 inches tall, each mini arcade cabinet is made from modeling wood and exact-scale graphic decals printed on vinyl. They also have simulated screens, coin doors and joysticks. Prices range from about $25 to $41, except for the sit-down Star Wars model.